The results for this poll are quite even. 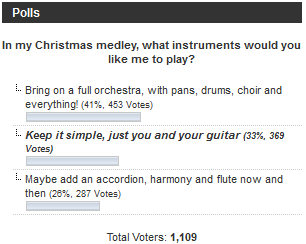 But most seem to prefer when there are lots of instruments going on at the same time. We will see what I’ll do, because it depends on whether it fits and stuff. So, some parts might be just me and the guitar, and then it builds into something with lots of instruments! As for the new poll, I’m simply curious about where you’re all from. :) Are there mostly Europeans (or even Scandinavians? ), or maybe North Americans? Maybe I have hundreds of African fans?! It remains to be seen! I’m looking forward to the Christmas medley, and I must ask if you have a certain song you like to play during christmas? skyward: You mean, if I listen to, or play on an instrument? Because I never play instruments or sing. :) Except when recording or making videos. But listening.. Well, I like “Driving Home From Christmas”. :D But I don’t really listen to Christmas music at home. It’s enough when I’m visiting family and stuff! Hey! All of your videos are so amazing, so creative! A new video with a lot of instruments would be cool:) But I also like your “medley videoes” with just you, your guitar (and sometimes piano, like on the “tv show medley”)I’m sure you can make something brilliant! Check out my youtube channel if you want, I’m also a musician!